Jens Soering has been locked up for more than three decades — 31 years, 7 months and 23 days, to be exact — after being convicted of the brutal murder of his girlfriend’s parents, Derek and Nancy Haysom. 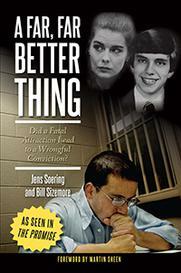 And for 31 years, 7 months and 23 days, Soering has steadfastly maintained his innocence. The Haysoms were killed in their Bedford County home on March 30, 1985, when their daughter and Soering were students at the University of Virginia. The Haysoms were each found with dozens of stab wounds and their throats cut from ear to ear. Their daughter, Elizabeth Haysom, pleaded guilty to first-degree murder as an accessory before the fact. She currently is serving a 90-year sentence, but will receive mandatory parole in 2032, when she is 68. Soering is serving two life sentences and has been denied parole 13 times. 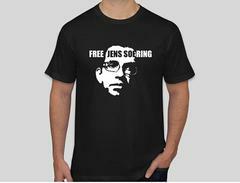 Now, after submitting a petition of pardon about 16 months ago, Soering is becoming more and more frustrated with Gov. Terry McAuliffe’s office for not having made a decision in his case — even as new evidence has come to light this month that he says proves his innocence. But multiple independent forensic analysts have confirmed that the Type O blood that put Soering behind bars does not match his DNA. The analysts also discovered that it’s possible there were two unidentified men who left their blood at the crime scene. That was not true, Soering said, because DNA analysis was successfully done on two of those same swabs in 2009. During Soering’s trial in 1990, Gist again testified that it was not possible to do any DNA testing on those pieces of evidence. At first, Soering thought Gist could have made a mistake and missed the physical samples left in the case file. But with 42 physical samples, and three swabs for each sample, taped to the file, Soering said it is unlikely that Gist would have overlooked those samples. Soering also has questioned the primitive nature of DNA testing in 1990 — maybe there wasn’t enough of a sample to do the testing back then. But there was more than a microscopic amount of blood on those swabs, Soering said. And Gist did not just testify that there was not enough material to test, Soering said, he testified that there was nothing physical left to test. “You can’t prove his intent, but you can say it was untruthful testimony,” Soering said. But according to Brad Jenkins, program manager of the forensic biology section at the Department of Forensic Science in Richmond, file storage in around the time of Soering’s trial was disorganized. The evidence could have been stored in any of a few different places, he said, and Gist may not have known the swabs existed. Jenkins said it is a concern if Burton and Gist did not communicate enough to realize the extra tests were stored in the case file. While Jenkins confirmed Gist worked out of the Roanoke office of the department back in the late 1990s, he said he could not comment on Soering’s case specifically. But in general, he said, forensic evidence for cases back then could exist in a couple of different places. Traditionally, when scientists were done testing whatever evidence was given to them, they would return the samples to the submitting agency — usually a police department. In the late 1990s and early 2000s, the department discovered that a couple of the scientists from the time of Soering’s case would keep some of the evidence and physically tape it to their worksheets, which would then be placed in the case file. Soering’s new supplement points out that the department’s then-serologist, Mary Jane Burton, did just that with samples of the Type O blood. The samples taped in Soering’s case file were tested in 2009 and later eliminated him as a contributor of that blood. Albemarle County Sheriff Chip Harding, who threw his support behind Soering’s petition earlier this year after working on his own independent investigation, said he is not convinced that Gist lied in his testimony. He said the testimony was not accurate, but there is not enough evidence to show he lied. Harding said he finds it difficult to believe that there was no discussion about the evidence between Gist and Burton. Since the early 2000s, the department has found hundreds of such case files, which are now being retested as part of an order from then-Gov. Mark R. Warner, according to Jenkins. The post-conviction testing is being done to see if any DNA evidence is available to either confirm a conviction or exonerate a wrongfully convicted person. The practice of taping evidence into case files was stopped around 1990 and now every piece of evidence is returned to the submitting agency, Jenkins said. In regard to the possibility of testing the swabs in 1990, Jenkins said there may not have been enough material to test. The first DNA testing in Virginia was done in 1989 and was in use at the time of Soering’s trial. Though it was cutting-edge technology at the time, Jenkins said, it required a blood stain about the size of a quarter — which may or may not have been equal to three swabs’ worth of blood. Today, DNA tests require an amount of blood about the size of the tip of a pencil, Jenkins said. While it’s impossible to know for sure, Jenkins said that even if Gist had the swabs, it still might not have been enough to do a DNA test. Multiple calls made to a Goodview phone number listed for an Elmer Gist Jr. were not returned. When asked, no one called back to report that the number belonged to an unrelated Elmer Gist, either. Exaggerated testimony and withheld forensic evidence are issues that are all too common in criminal trials, according to Brandon Garrett, a law professor at UVa who has researched and written about DNA exoneration. Garrett — who wrote an article for the Virginia Law Review that included the now-discredited testimony of Robert Hallett about a bloody sock print attributed to Soering — said sometimes forensic experts can make something seem more important that it really is. “It was really common to overstate testimony,” Garrett said, adding that the FBI has since audited hundreds and hundreds of cases, only to find that some of their forensic evidence was not presented in a proper scientific context at trials. In the 1980s and 1990s, there weren’t a lot of clear rules for talking about forensics, Garrett said, and some overstated the evidence because they wanted a conviction. There were also a lot of cases in which there was evidence that could have been tested for DNA, but the defense was never told about. “We see that over and over again in exoneration cases,” Garrett said. Soering also has become frustrated with McAuliffe’s office regarding his petition for pardon. McAuliffe denied Soering’s bid for pardon earlier in his term as governor, and has not looked at the case since the petition gained more evidence. McAuliffe’s office typically receives about 15 to 25 pardon requests per week, officials said. Since taking office in 2014, McAuliffe has granted 193 pardon petitions (including simple, conditional and absolute pardons) — more than any other governor in history, according to Brian Coy, a spokesman for the governor’s office. Coy said the governor’s office has not yet received an in-house investigative report on Soering’s case and does not expect to receive one before McAuliffe leaves office. In an interview with ABC 13 WSET earlier this month, McAuliffe said the investigation will not be done and it will be Gov.-elect Ralph Northam’s decision. “I take this very seriously, but it has to go through the process, and the by time it is done, it will be done and no politics or letters to the editor or phone calls to me are going to sway that,” McAuliffe said in the interview. Though McAuliffe likely will not grant him his freedom, Soering said he has not given up hope and that the governor has all the facts he needs to at least grant a conditional pardon. In a conditional pardon, the governor can modify or end a sentence imposed by a court, but there must be extraordinary circumstances for the measure to be considered. With rumors floating around that McAuliffe is looking at a 2020 presidential run, Soering said he is worried the governor is letting his political ambitions overshadow the investigation of his petition.